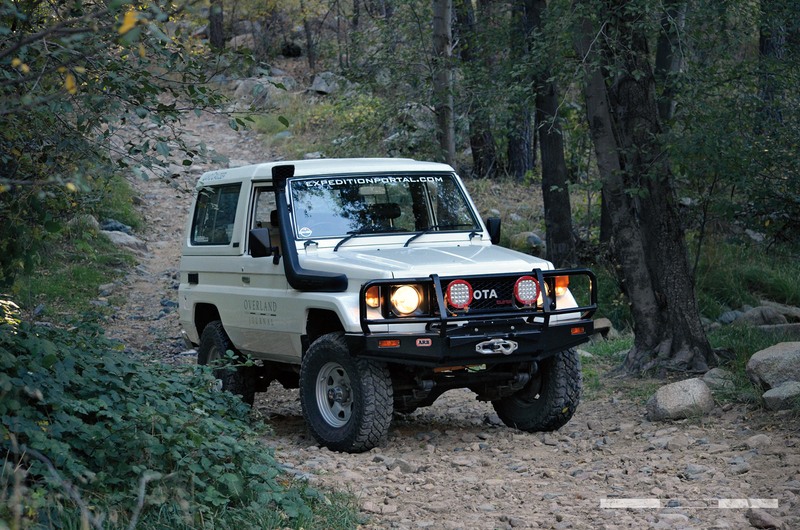 The grass is greener on the other side, at least when it comes to Land Cruisers. As of 2014, Americans were able to begin importing the venerable 70 Series into the United States under the 25-year historic vehicle exemption. Fortunately, these are Toyotas, so even at a quarter-century old they are (often) still quite serviceable as legitimate overland platforms. 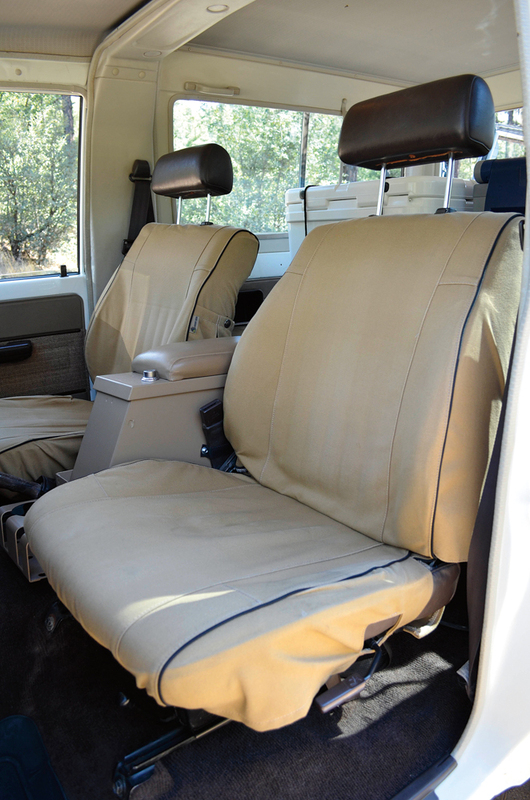 In late 2014, we worked with Land Cruisers Direct to purchase a lightly used BJ74, the first year of the 13BT turbo-diesel and a mid-wheelbase configuration. It doesn’t exactly have the spaciousness of the Troopy but is better for adventures on the technical routes common to North America. It arrived—all the way from Japan—complete with 1980’s decal stripes and the steering wheel on the right side. 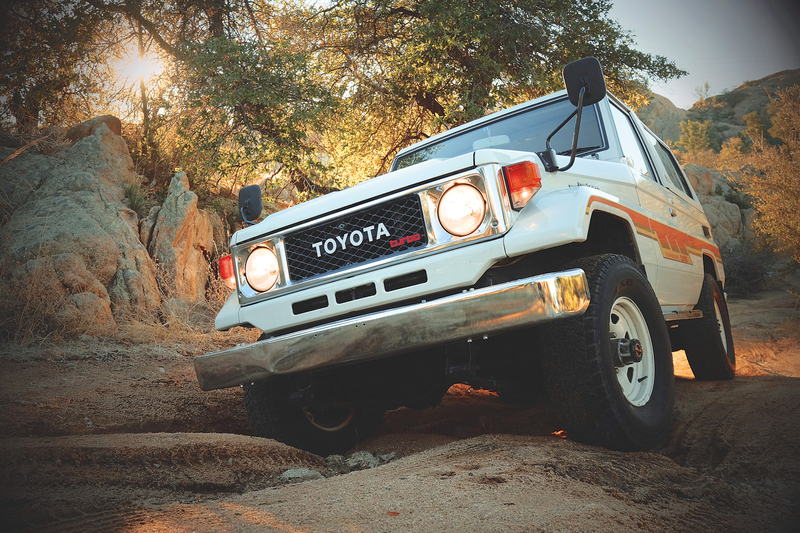 Just to make sure I am being transparent to the uninitiated, the 70 Series is essentially a street-legal tractor and only handles slightly better—it is the pinnacle evolution of the Land Cruiser line though. It has solid axles and leaf springs, but it also came equipped with front disc brakes, power steering, and air conditioning. 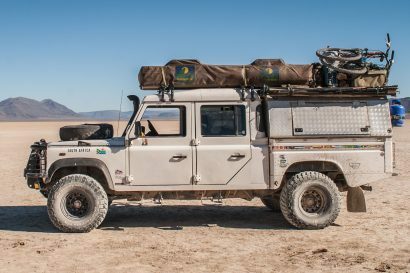 For my sensibilities, this is exactly what I want in an overlanding vehicle, even down to the complete lack of computers—not even one. The engine and every other function are controlled by old-fashioned pumps, relays, switches, and mechanical systems. Turning the key opens a fuel solenoid and engages the starter. High compression ignites the diesel fuel, and the process continues until that same fluid solenoid closes by turning off the ignition. Opening the hood reveals something that looks like a motor, complete with exhaust, a little turbo, belts, and pulleys. With a little care, these engines will run for a half million miles or more. 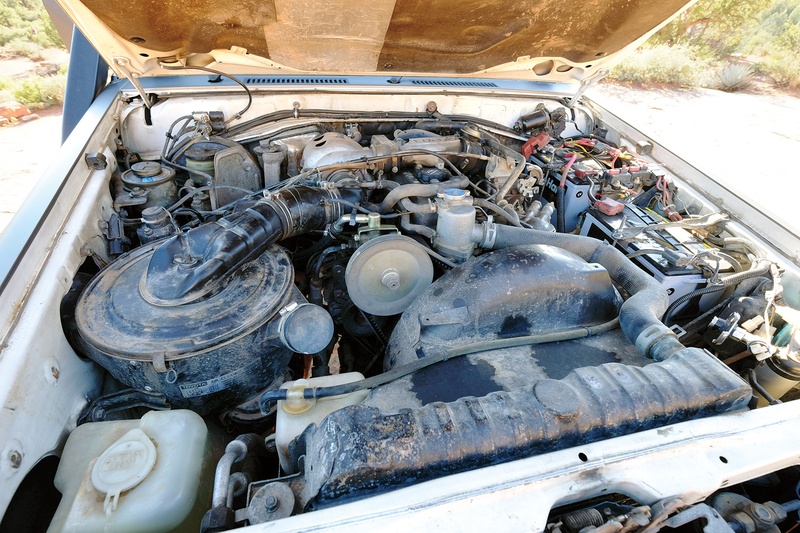 The powerplant is connected to the tried-and-true H55F 5-speed transmission, a heavy-duty box with both a granny low first gear (4.843:1) and overdrive fifth. Next in line is a massive transfer case with high and low range and a real shifter; no knobs to turn or traction modes to select with fancy chrome joysticks—beautifully old school. The part-time t-case drives a beam front and rear axle, both full-floating and containing 9.5-inch ring gears and 30-spline axles. The rest of the undercarriage is equally impressive with a steel ladder frame. Inside, the Toyota is all business and not the Wall Street type; rather, busting through the jungle, felt Fedora-style business. 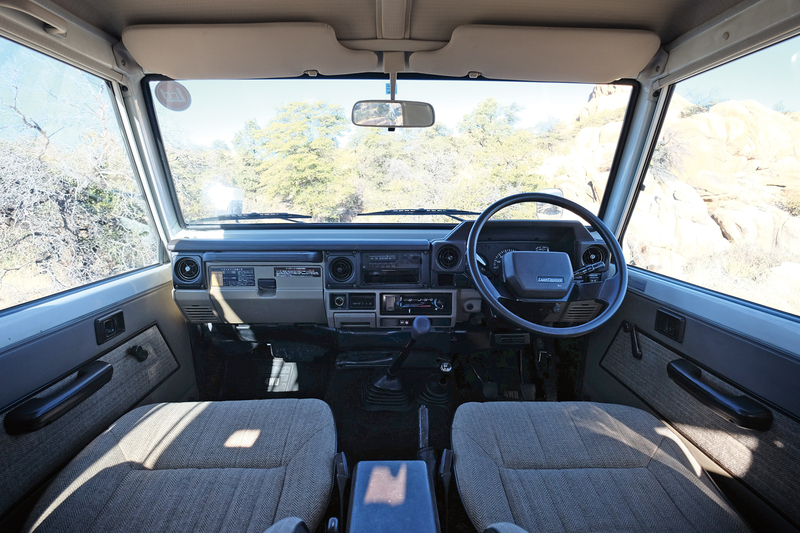 A metal dash with intermittent plastic bits provides a completely functional space—the only nods to luxury are the air conditioning and AM radio. All that remains is the pure pleasure of driving something precisely designed to cross Africa or any other continent of your choosing. Even in stock form, it was a true gem; there were some modifications we completed to improve performance and convenience though, and we had to do something about those fender mirrors. Starting with the front, we chose a proper ARB bull bar, the goal being to both protect the radiator from an animal strike and to serve as a place to mount the Warn Zeon 10-S winch. We knew that the vehicle would often travel solo, so self-recovery and protection were important. 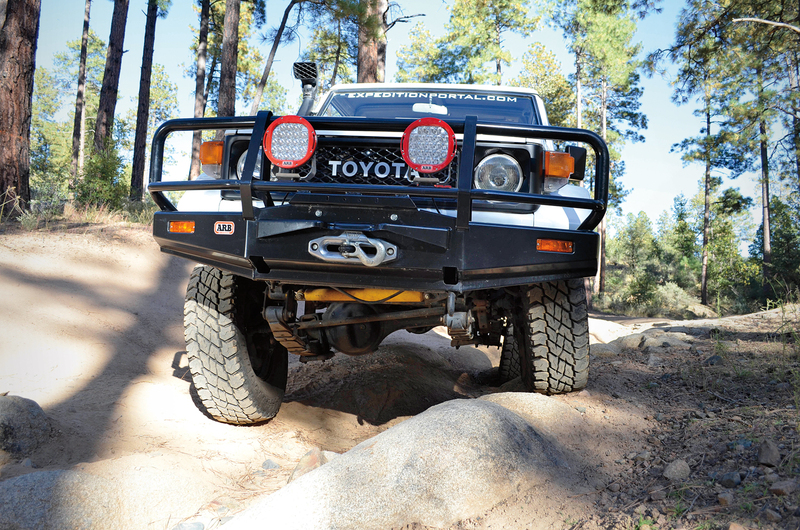 This led to the decision to fit an Air Locker to the rear axle for improved traction in challenging terrain. 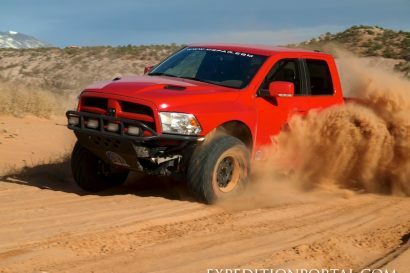 Additional ground clearance and increased articulation were also in order, so we worked with Kurt Williams from Cruiser Outfitters in Salt Lake City to select and install a heavy-load-rated Old Man Emu suspension and Sport shocks to all four corners. This kit has been a pleasant surprise, proving to be both comfortable on the highway and quite flexy in cross-axle terrain. Tires are always an important upgrade, and given that the BJ started its life as a mapping vehicle for our project with Hema Maps, we focused on carcass durability and lug integrity. 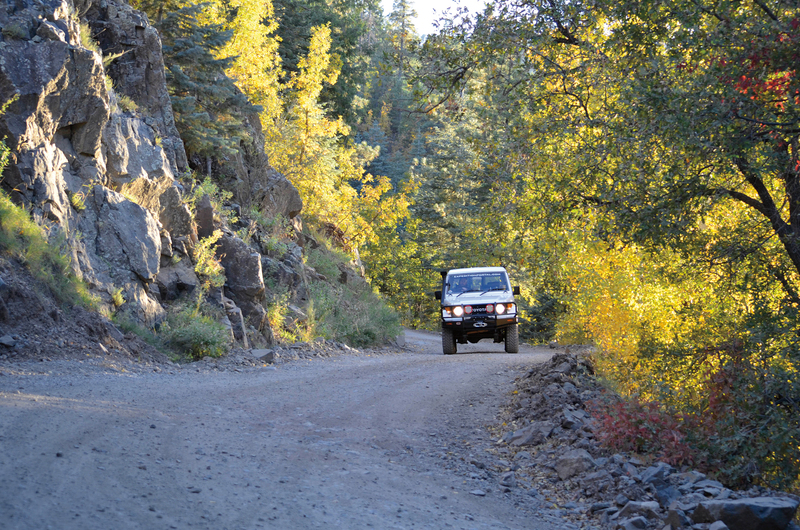 So many of the new tires on the market emphasize looks over longevity and tend to chunk and tear on rocky terrain. As a result, we specified a Cooper Discoverer S/T Maxx in 255/85R16. An extreme-duty model, it features a triple-ply sidewall and large, reinforced shouldered lugs. The tread design is a good compromise, more aggressive than an all terrain, but more appropriate for road and wet/ice conditions than a true mud terrain. For airing up after days in the dirt, we installed an ARB compressor under the hood. Final trail modifications included the requisite snorkel, mostly for dust, but also to protect from the occasional deepwater ford. 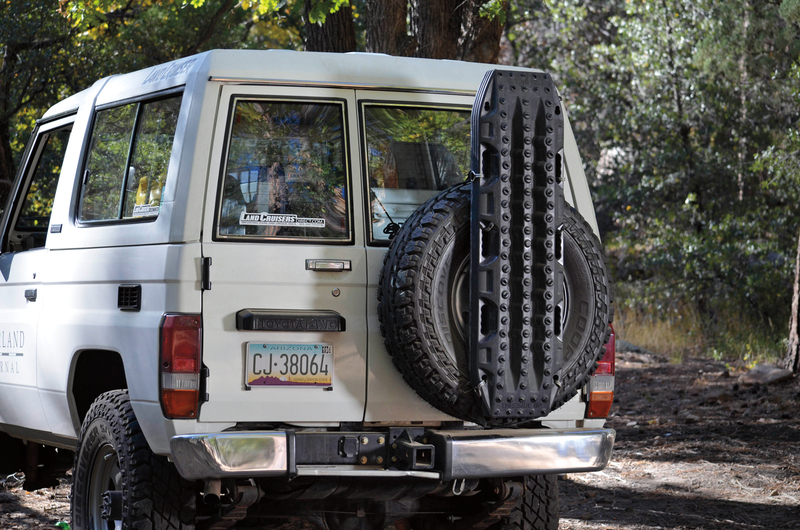 We mounted four Maxtrax to the spare tire, something we never leave home without. A few typical accessories were eschewed, principally a roof rack. The BJ74 is delivered with a fiberglass reinforced plastic (FRP) top, so there is not a continuous rain gutter around the perimeter, making it difficult to mount a rack without major modifications. We also left off rock sliders and an HD rear bumper in an attempt to minimize weight, at least for now. 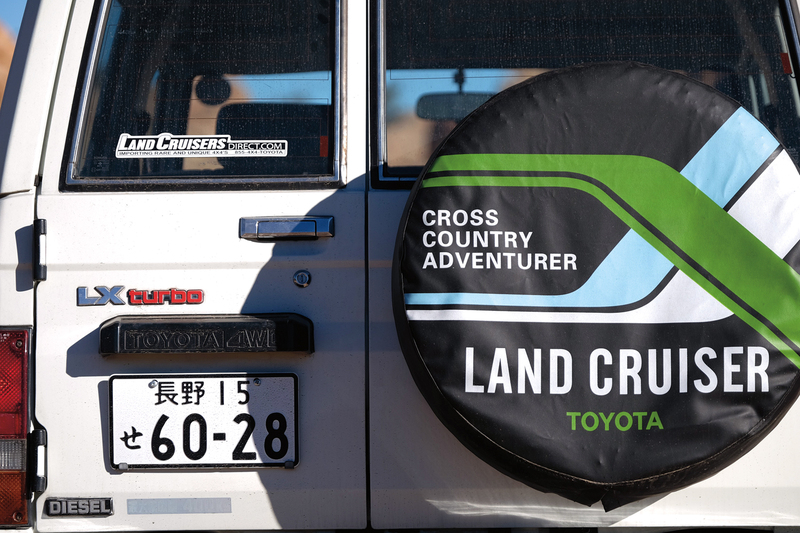 Overall, we have been extremely impressed by the trail performance of the Land Cruiser. The end result brings back memories of the PZJ73 that I raced in the Outback Challenge. The combination of the shorter wheelbase, good articulation, rear locking differential, and taller tires all aid in clearing difficult obstacles. Most importantly, we retained good road manners and achieved all of this without requiring custom or irreversible modifications, something critical when you need to pull parts off a junkyard Cruiser in the middle of the Congo. 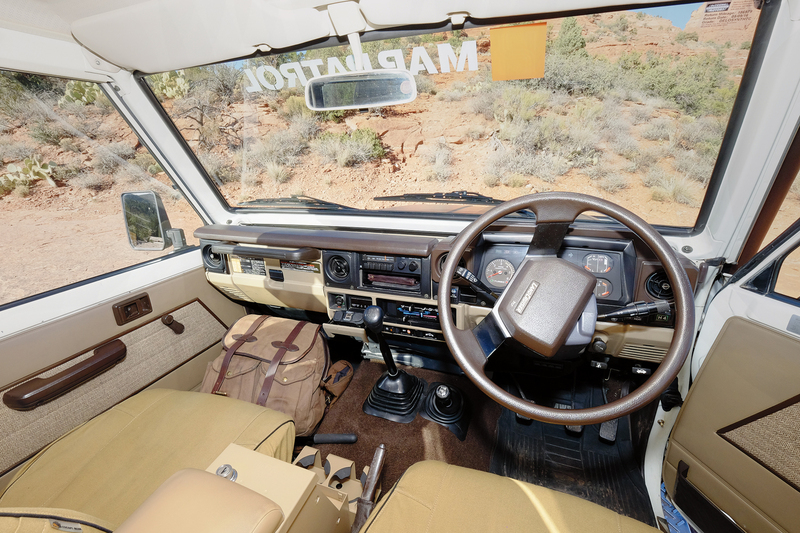 The vehicle spent most of its first year here in the field, mapping many of the classic overland routes in Arizona, California, Utah, and Colorado for our Hema track-truthing project. Because of this, a full complement of camping gear was required, from a ground tent to a fridge. However, the BJ is smaller than most wagons or pickups, so compact choices were plentiful, all supporting our (generally) minimalist ethos as travelers. 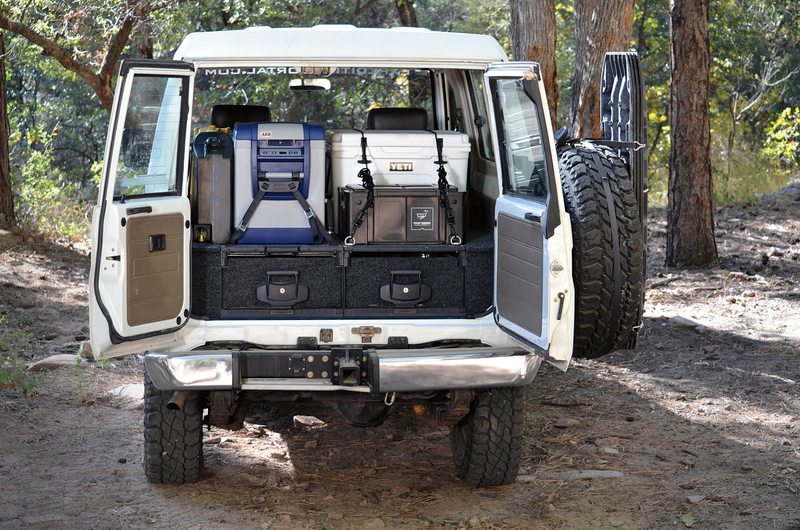 The first modification set the foundation for organization by installing full-length ARB drawers in the rear and putting an ARB 50-liter fridge to the platform. Next to it, we mounted 40 liters of water in Front Runner water tanks and 20 liters of extra diesel in a Wedco can. Organized inside the drawers and in a series of plastic Front Runner boxes are the kitchen kit, tools, recovery gear, and spares. The tents used thus far have varied from an Oztent Jet to an ARB Skydome swag. The tool and spares kits were outfitted with extra fluids, parts, and tire repair items. For self-recovery, we improved our chances with a Pull-Pal ground anchor, shovel, and traction mats. To work around the 24-volt electrical system, we installed redundant 12-volt converters to supply USB and cigarette lighter ports. With navigation, we still trust the Hema Explorer app and their new HX-1 GPS for recording tracks and route planning. The little Land Cruiser has proven to be an absolute joy to own and drive, and it has completed nearly 20 overland routes and over 25,000 miles across the country. 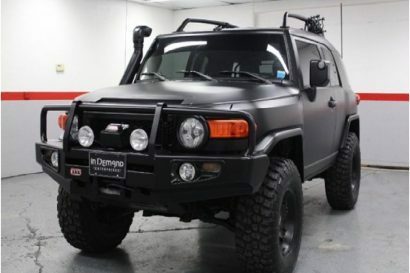 After serving as the Map Patrol for North America, we decided to give it a cosmetic refresh and delivered it to the best Land Cruiser restoration company in the U.S., Proffitt’s Resurrection Land Cruisers in Colorado. 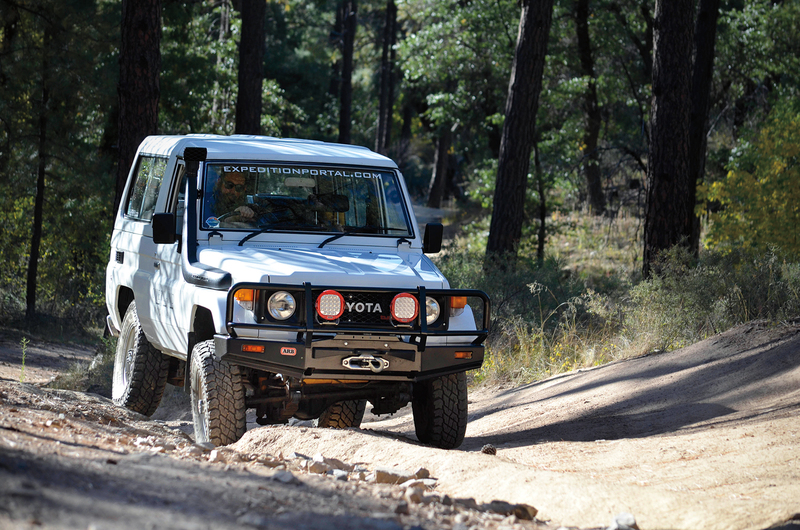 Jeremiah Proffitt was responsible for building the Expeditions 7 Toyotas and is a true specialist with the 40, 60 and 70 Series. His team performed a full repaint and addressed some minor corrosion and body damage issues in the process. It looks better than new and ready for another 28 years of service. So, what is next for the mighty 74? It spent a few months on display at the Yeti flagship store in Austin, Texas, and is now sitting ready for the next adventure. Baja sure is beautiful this time of year.